The security alarm industry is one that’s worth about $23 billion, according to the market research group IBISWorld, with annual growth approaching 5% and over 50,000 businesses in the market. If you’re in the security alarm business, that brings good news and bad. The good news? The market is plenty robust and offers a lot of room for expansion. The bad news? There are plenty of competitors, large and small, all looking to get their share of the pie as well. That means you need every tool you have to stay on top of your game and edge out the competition. On simple way to streamline your business and improve efficiency, necessary steps to staying competitive, is buy automating the customer billing and accounts receivable processes with recurring billing software. Even modestly-sized security and alarm companies have a large number of clients, from smaller home security accounts to larger business customers, many with different billing dates, levels of service, and other particulars. This is great for a company’s big picture, but it can mean huge headaches when it comes time for billing. Hours of going over line items, tracking down payments from unresponsive customers, keeping track of new business and sign-offs: all of it’s necessary, and all of it takes time and costs money. With a recurring billing platform that automates the process, you can free up time and payroll costs for more important things, like providing your customers with the security service they deserve (not to mention getting some time off every once in a while). If you’re looking for an automated billing solution for your alarm or other security company, Subscription DNA is the best choice out there. Subscription DNA’s cloud-based SaaS platform provides solutions for automated recurring billing, one-time payments, variable rates, multi-period billing, automatic rebilling and dunning management, taxes and fees, multiple payment methods, and more. Subscription DNA also offers the highest levels of security and PCI Compliance to give both you and your customers ultimate peace of mind. What’s more, Subscription DNA’s communications tools can also help manage your communications with existing clients via emails and reminders, as well as helping secure new business with drip campaign software solutions. 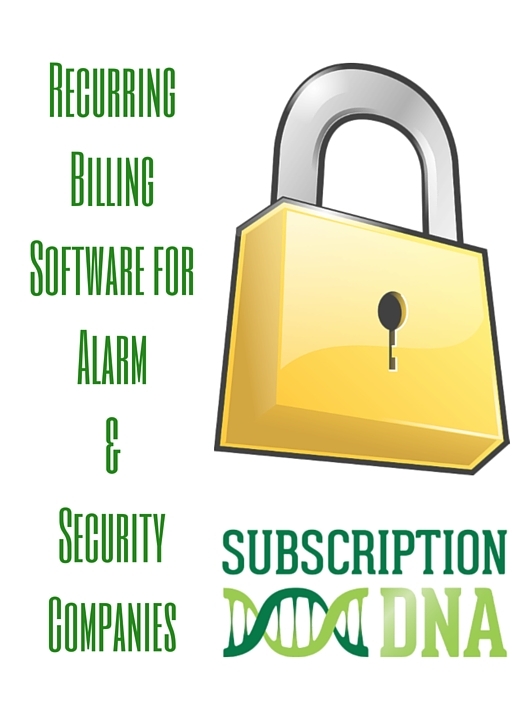 To learn more about Subscription DNA’s billing platform for your alarm or security company, and how it can help your business to thrive, get in touch by calling 513-574-9800 or by filling out the form below.